For its second year as the "New Cherokee", the 2015 Jeep Cherokee V6 gets start/stop technology. The EPA's just validated a few scraps of fuel savings over the outgoing model without automatic shutdown– as much as 2 full MPG in city driving. Specifically, the V6 FWD 2015 Cherokee gets 21 MPG city and 29 MPG highway; up from 19 city and 28 respectively. The V6 4WD Cherokee is up to 20 MPG city and 28 MPG highway. The outgoing model was good for 19 MPG city, 28 MPG highway. Engine output for the 2015 Cherokee's V6 remains the same as last year: 271 horsepower, 239 lb-ft of torque. 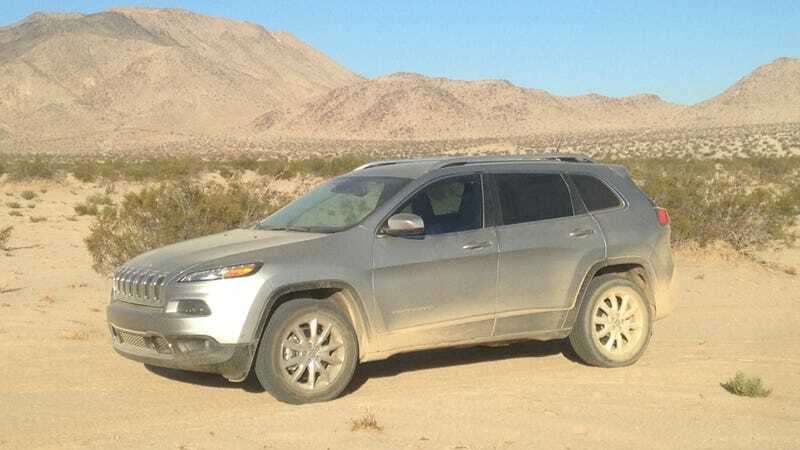 For reality-check reference, I clocked 25.1 MPG average in a 2014 Cherokee V6 4WD Latitude over about 800 miles of SoCal stop-and-go, highway cruising, and chasing tumble weeds around the desert. Ah, hell. Yeah 1 MPG isn't really that significant if you're already getting 28. Better than nothing, or would you rather have the piece of mind that comes with having your car not shut itself off in the middle of traffic? Start/stop definitely puts a damper on your launch off a light, but in everyday driving it'll be started up quicker than you can get through that last text message (0.3 seconds). Automobile had the brilliant idea of making a little comparison chart, which I have shamelessly decided to recreate myself for your convenience.